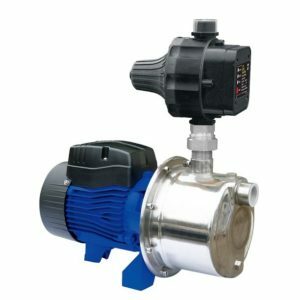 4-5 Tap Pump Bianco BIA-TECHG60MPCX is a small 5 tap pump which can be used around the house, farm or hobby farm. The TechG60 comes with a 0.45kw electric motor, it has a top head of 45 metres, a maximum flow rate of 55 litres per minute and has 25mm inlet and a 25mm outlet. The pressure controller is 1.5 bar. This is a simple, low cost pump which is often used to augment water supply by boosting domestic systems and it is ideally located next to the tank. 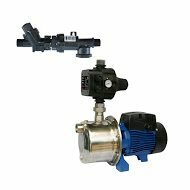 To maintain pressure in the system the 1.5 bar pressure controller provides constant pressure by switching the pump on and off each time a tap is turned on and off. If the tank runs dry the pump will automatically turn off protecting the pump. The TECHG60 water pumps are used where only small flows of water are required, which is often around the garden or for smaller water troughs. When the TECHG60 is installed a pump cover should be used to protect the pump or alternately the pump should be located indoors.